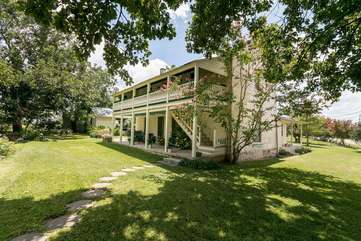 Located on the banks of the Pedernales River, only fifteen miles from Fredericksburg, in Stonewall is a charming old two-story limestone rock home. Upstairs above the homeowner's home is "Heimplatz Am Fluss" which means "Home place on the River". The home was built in 1880 by Henry Jacoby and bought by your hostess' family in 1950. A great deal of work was done by the family toward the complete restoration of the upstairs suite. Outside on the porch, the staircase leads guests to the upstairs suite. Original to the home is the porch, which has an unusually low roof. Inside are three rooms all with the original wood floors. A deep green floral rug attractively accents an antique love seat. A table for two is cozily situated in the corner and a family heirloom cabinet is used as storage for kitchen necessities. The kitchen also has a small refrigerator and coffeemaker. Crocheted pillows and dust ruffle accent a queen-size bed topped with chenille spread. Antique dressers found in the bedroom are family keepsakes. The armoire, built by your hostess’ father in the early 40’s is wonderful for hanging clothes. The bath has a tub with shower. Heimplatz is located two blocks from Highway 290 Wine Trail on the banks of the Pedernales River. While visiting this old German homestead enjoy the seasonal flower gardens so prevalentl on the property. We loved staying here and taking in the local culture and history. It's always special to stay in a place that is well-loved and rooted in a family history. We had a great stay! Wonderful historical building. This was an old fashioned home that met our needs perfectly. Loved the hominess and the personal touch. I booked this trip last minute for my one year anniversary celebration with my boyfriend. We loved every second of this trip. Our stay in the little cottage was so perfect! It was clean, quaint, and full of history. My boyfriend and I enjoy antiques and history. Our favorite details were the furniture and the photo albums. You can feel the history in the walls. My favorite detail of the stay was the heater in the bathroom. My boyfriends favorite part was the warm pastries every morning. I recommend this stay for anyone looking for a sweet escape! Wine is so close and beauty is all around you! The river runs just outside your window to rock you to sleep. My husband and I booked this cozy little cottage for a last-minute Labor Day weekend getaway, and it was everything we could have hoped for! Secluded and peaceful, yet only a 15-20 minute drive from Fredericksburg and plenty of shopping and restaurants. Clean and tidy. Picturesque. Our hosts delivered breakfast to us each morning, and both mornings featured delicious home-made pastries and fruit. There was no WIFI, but the place is so relaxing and beautiful we didn’t even care! We wanted to visit the Fredericksburg / 290 Wineries Row but get tired of staying in commercial hotels. This was a beautiful option and very worthwhile. The listing is exactly as described. It is very easy to enter and exit as you have your own parking. It is very private. Best of all are amazing breakfasts you can enjoy while rocking on the porch watching the hummingbirds in the garden. We will return here on our next visit!